and i've taken the last two weeks of the month off from work to play, er, uh, help out down here in fremont. so the posting will continue to be really light for a while. having a blast. wish you were here. if you live in the bay area and want to have a good time outside, come check us out. we are at the ardenwood park in fremont. e-mail for directions or post here and i'll try to get back at you that day. tractor rides, anyone? i've long been called a fascist pig by those that believe it is my duty to support them with no say in how my financial contributions are used. a lady in my world history class in college years ago was furious that i told her she was the one to blame for her f**ked up life by having kids when she was 16, among other reasons. so all of the flailing of the president since katrina has just been sand under the saddle to me. a constant itch and irritation. while visiting snopes checking out a different article, i came across this one by a Canadian. i don't subscribe to the "if it's in a foreign paper it's true" school of thought. i do subscribe to "that makes a lot of sense, so i'll blog it" school. Enter Jesse Jackson and Louis Farrakhan. Jackson and Farrakhan laid blame on "racist" President Bush. Farrakhan actually proposed the idea that the government blew up a levee so as to kill blacks and save whites. The two demanded massive governmental spending to rebuild New Orleans, above and beyond the federal government's proposed $60 billion. Not only that, these two were positioning themselves as the gatekeepers to supervise the dispersion of funds. Perfect: Two of the most dishonest elite blacks in America, "overseeing" billions of dollars. I wonder where that money will end up. it is still news. i still hear about how the government left these poor people to fend for themselves, that there was inadequate preps made, that the bush whitehouse is to blame for all of the problems noted in the whole friggin world, etc etc etc. enough. katrina devastated an area larger than the entire country of england. just WTF do people think the capabilities of our government are? i suppose that next i'll be called a fascist, racist pig. so far off the mark that it isn't even on the paper, but that's ok. those that refuse to see the truth, and blame the messenger, those are the ones that should shoulder the blame for the attitudes and dependencies found throughout our country. they are the source of the problem. i'm just reporting it. a new way to beat the high price of gas? her rounds visiting homebound patients when she ran out of gas. the station to borrow a gas can and buy some gas.? way to see a patient, she decided not to wait and walked back to her car. spotted the bedpan she was taking to the patient. her tank two men watched from across the street. I found myself behind a car in Vermont, in the US, the other day; it had a one-word bumper sticker with the injunction "COEXIST". It's one of those sentiments beloved of Western progressives, one designed principally to flatter their sense of moral superiority. The C was the Islamic crescent, the O was the hippie peace sign, the X was the Star of David and the T was the Christian cross. Very nice, hard to argue with. But the reality is, it's the first of those symbols that has a problem with coexistence. Take the crescent out of the equation and you wouldn't need a bumper sticker at all. Indeed, coexistence is what the Islamists are at war with; or, if you prefer, pluralism, the idea that different groups can rub along together within the same general neighbourhood. There are many trouble spots across the world but, as a general rule, even if one gives no more than a cursory glance at the foreign pages, it's easy to guess at least one of the sides: Muslims v Jews in Palestine, Muslims v Hindus in Kashmir, Muslims v Christians in Nigeria, Muslims v Buddhists in southern Thailand, Muslims v (your team here). Whatever one's views of the merits on a case by case basis, the ubiquitousness of one team is a fact. i was listening to the radio on the way to work this morning, i heard a pretty funny joke. politics aside, if it's funny, it's funny. the president was sitting at the head of the table during the morning briefing. rumsfeld was reading off the latest reports from iraq. "3 brazilian soldiers were killed outside mosul yesterday". bush lets out a loud moan, and places his head in his hands, shaking his head back and forth. the staff was stunned at the uncharacteristic display of emotion from the president. they all sat looking at each other in shock, wondering what to do next. SecDef finally broke the silence by asking the president if he was ok.
bush raised his head and said "three brazilian soldiers were killed? that's horrible. how did this happen? and rumsfeld, how many is a brazilian?" this in front of our building. the backhoe operator had been doing some building destruction of the facility across the road. 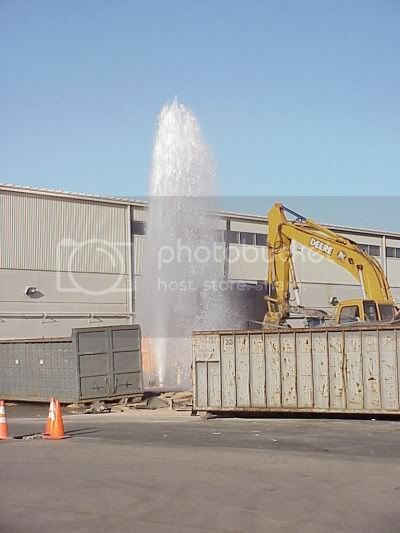 i guess he got a little carried away, and didn't think that dumping stuff into a dumpster, then crushing it down with the backhoe might not be the best thing to do next to a charged fire hydrant. to make matters worse, he sheared it off below the welded flange. and to make it even more worse (? ), the storm drain system is getting gutted and rebuilt, so all the storm drains all around the area are barriered off with sandbags and the like. so we had us a nice little lake going there for a while. it took close to half an hour to get the water turned off. imagine how much water that is. i wish i'd been able to get to the camera sooner, because when i came out, the operator was just getting down from the machine, pulling out his cell phone. i can't imagine that was a pleasant conversation. i was driving home from work tonight, and i heard on the radio some woman in stockton was arrested and charged with 3 felonies. her crime? she claimed to be a hurricane katrina victim from new orleans, and was given somewhere close to $1000.00 in emergency funds, food, clothes, and i think they said shelter. except, she's from stockton, has been living in stockton for a while, and probably couldn't find new orleans on a map if you blanked out everything else. and this is just a couple of instances, here in CALIFORNIA, a long ways away from anywhere that even saw a cloud from the hurricanes. imagine the fraud and thievery going on in the thick of it. when people are really hurting, and society opens their hearts and wallets, it's sickening to think there is a segment in our country that sees opportunity to rip off the system. the folks that really need it may not get the help offered, because some low lifes decided they could make an easy killing by relying on the goodness of others. vigilance committees of old might help solve some of these problems. nothing like a good hanging at the outskirts of town to get your message across. it sure as hell won't be the government that regulates this fairly. they are so swamped right now you could probably convince FEMA of anything. or else it will get so difficult to distribute assistance because of the checks placed in the system to avoid fraud. either way, the ones that really need the help will probably not get it, or have to jump through a plethora of hoops, at a time when they need a hand, not a back hand slap. i'm back from my latest adventure. i really learned a lot about shipping radioactive materials by air.... oh, wait, uh... you didn't know that the airplane you ride on might have radioactive materials under your seat? or any number of other hazardous materials? HA. guess you learned something too. the FAA is not shy about levying fines for stupidity. batteries have become one of the number one issues for carriers. more packages are being shipped with batteries than ever before. and they are causing many, many problems, including grounding aircraft due to fires. if you want to send a component that uses a battery, remove the battery, and put a completely sealed fresh package of batteries in the box. shitcan the ones you took out of the component, or use them around the house. just don't ship them. the FAA is not shy about sending people to jail. the old "shipping clerk" of yore is rapidly becoming a thing of the past. especially in businesses that deal with hazardous substances. the definition of hazardous substances might surprise you. have you ever ordered some food product, or some other product that was shipped with dry ice to keep it cold? guess what? that was a hazardous substance shipment. many of the folks in the fedex class i took were PhDs at research facilities, as well as a scattering of military (yea, imagine having to fill out the shipping manifest for a truck load of bombs), and others like me, where shipping is just another of many collateral duties. the FAA inspects at a minimum 50 shippers a year, per district offce. i don't know how many districts there are in the FAA, but the chances of getting audited goes way up if you make mistakes that get your shipments bumped back from the carrier. bottom line, don't screw up. the FAA is way less humorous than the Dept of Transportation (they regulate ground shipments). way, way less humorous. as in, they have no sense of humor whatsoever when it comes to screwing up a shipment. something about airplanes loaded with passengers, or something like that. anyway. it was a good class, and i'm glad i got the chance to go to it. in denver. where, as one local put it, "everyone drinks beer and eats steaks". sounds good to me! 5th sentence of the 23rd post? "Excuse me, but I have minds to twist, and values to warp"
p.s. denver is a nice city to visit. the downtown area is worth the price of admission (that damned airplane ride). i thought it was a grand idea to block off 16th ave. and use it as a pedestrian mall. the cross traffic isn't a real problem. having almost 2 miles from the train station to the capital set aside worked for me!